I woke up to the call of the African Hoopoe bird and felt the early morning sun warm my face as I lay in my bed looking out the window of my small cabin. What day was it... Tuesday? Wednesday? I couldn't remember. It still seemed like a dream to me. My daughter Erin and I had already been in Africa over a week now, in the wild and rugged part of the continent known as Namibia. Our first days had been spent around the wilds of the Etosha National Park where we had watched and photographed a variety of wildlife in their natural enviroment. The park covers over 7000 square miles of area with thousands of different species of Africa's animals from the largest to the smallest. We had the opportunity to photograph elephants, lions, zebras and ostriches just to name a few. The place was truly a marvel of God's creation seemingly untouched by man's hand. The first weekend we also spent up in the north of Namibia near Biermanskool at the ranch of Jas and Hannetjie. Most gracious hosts where I got my first taste of hunting and harvested a lone cull warthog on their ranch. The kindness they showed us was better then any record book trophy and was reflexive of all the hospitality we experienced from the Afrikaaner friends we made in Namibia. I had never thought I'd ever visit Africa let alone hunt there, but several months earlier this whole adventure began. I'd read an article in one of our churches publications about a small group of Afrikaaners in Namibia that two professors from our seminary had visited. The article had mentioned that one of the families they had visited had a large ranch and a professional hunting business. With the information I had, I contacted the Duvenhages of Uitspan Hunting Ranch and started a series of correspondences that now had me looking out the window of a small cabin in a hunting camp in the middle of the Kalahari Desert. Our hosts the Duvenhages had picked us up at the airport in Windhoek, the capitol of the country, a week before and after a few days of watching and photographing wildlife we were now about the business of hunting. At least I was, Erin preferred to relax and enjoy the scenery with a good book. The Duvenhages, Michael and Tienie and their three children Maria, Jan-Hendrik and Isabella, lived far from the rush of city life on their ranch which was nearly 50 miles from the nearest town and several miles off the gravel road that ran through their property. To call them gracious hosts would be an understatement,within a couple hours of meeting them, we felt like family and were treated as such. Anyway, back to the hunt. Tienie had a light breakfast ready for Michael and I, as she knew that one does not trek well in the bush on a full stomach. So after a some good Dutch rusks and a cup of black coffee we headed off into the bush. In the cool crisp air of the early morning the sounds of the Kalahari were all around us. Even though it was late in the dry season, there was still much color and the air was full of sounds and smells to greet us. A virtual symphony of birds and insects entertained us as we worked our way through the soft sand and camel thorn tree of the velt. This morning we were hunting the Greater Kudu. The African Greater Kudu is a must have for any first time hunter's trophy list in Africa. The kudu is called by some the "Grey Ghost of Africa" for its ability to quickly disappear into the bush.It's a large antelope similar in size to our elk here in the states, but with long spiral horns that spiral up and away from the head. It wasn't long until Michael spotted a small group of bulls about 500 yards from us. We worked our way toward them with the wind in our faces using the brush as cover. Suddenly, as often happens in Africa, we were surrounded by a large herd of Springboks. Springbok are a small antelope that look very similar to the pronghorn of our Western Plains here in the U.S. The main difference is their horns which rise up and arch out resembling the lyre or harp of old. To make a long story short - the springbok spotted us and spooked the kudu bulls. Our stalk was over. We hunted the rest of the morning and saw springbok and a few steenbok but no more kudu. As I learned quickly, the morning and afternoons are the times for the best hunting, so as it was approaching noon, we headed back toward camp. Tienie may have had a light breakfast for us but she knew after a morning of trekking through the bush a hearty lunch was in order. After a lunch like her's there is only one thing to do. Take a little nap. The midday heat had the same affect on the game, which were also looking for relief from the hot sun of midday. 3:00 in the afternoon we headed out again. The kudu was becoming an elusive target and after a couple of hours it was beginning to look like we would be returning to camp empty handed. Suddenly Michael whispered "Gene, get down". He pointed off into the distance and near some large Camel Thorn trees stood a small group of gemsbok. "There's a nice one there", he said, "let's go for it". 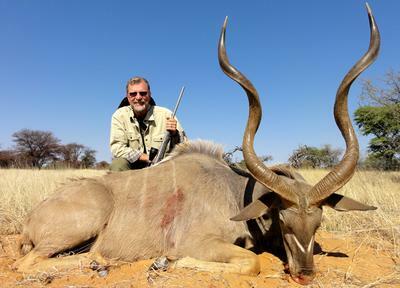 For a hunter on his first trip to Africa the Gemsbok or sometimes called Oryx is also a must have trophy. It's a beautiful animal with long white "stockings" on its legs and a black and white "mask-like" face that contrast with its grey body. This is all topped off with long slender horns that typically reach over 36" in length.The gemsbok is on of the few animals in Africa that the female is sought after more then the male as her horns are usually longer and more uniform, while the male are stubbier and usually broken off from fighting. The group was about 400 yards from us and we had the wind in our favor but very little cover between us and them. Michael saw a small bush about half the distance to the herd so he got down on his knees and began crawling toward it. What a day for me to wear my hunting shorts. The bush showed me no mercy as I crawled to keep up with Michael. We slowly gained ground on the herd and finally Michael said,"I think we're close enough". He ranges the group and they were at about 225 yards. A long shot by my Wisconsin whitetail standards, where the typical woodland shot is around 50 yards, but attainable with the Ruger 300 mag I was shooting. Michael set up the shooting sticks, which is the signal that the PH is ready for you to shoot,and I got into a sitting position. He then pointed out which of the herd was the biggest and told me to shoot when I was ready. When I looked through the scope I had a clear view of a beautiful long horned trophy. Michael could see I was shaking a little and said "Take your time. They haven't seen us". I settled down and took a couple of deep breathes and slowly let them out. As I squeezed off the shot, the discharge surprised me. "That was good" I thought. "A good hit". Michael's response added to my excitement. The herd had never saw us and ran quartering toward us after the shot and as we watched them come closer, we saw the big female go down. My heart was pounding as we walked toward the spot where she went down. As we came on her it was obvious she was a great example of this famous antelope specie of the Kalahari. Her horns measured just under 38 inches and were within a half inch in length of each other. After pictures and congratulations all around, Michael called his son Jan-Hendrik on the radio to come and help us get our prize back to the ranch where it could be dressed out and hung in the cooler. It amazed me how well Jan-Hendrik, who was only 9 at the time, could find us and get around in the Toyota through the rough and rugged terrain of the ranch. I guess farm kids back in the states do the same. I could see Jan-Hendrik was a hard worker and worthy of my respect. 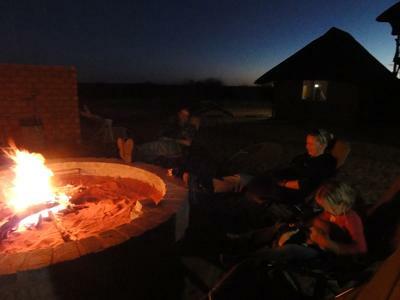 Later that night back at the camp we enjoyed a meal of fresh gemsbok grilled on an open fire to perfection by Michael. I was amazed how much it tasted like our Angus steers on the grill. We then enjoyed a time of fellowship and song as our host entertained us with old Afrikaans folk songs with Tienie accompanying on the squeezebox accordian. Truly it was a night to remember. The next morning we were out again. This time we were successful with the kudu. Michael found a small group of cows with a nice bull hanging with them. I was able to get a clean shot off at 80 yards and the bull went down quickly. It was a nice bull with the horns measuring 47 inches on the spiral. I got my "Grey Ghost of Africa"! Uitspan. Uitspan is the name of the Duvenhages' ranch. will never be forgotten. The friendships we made, and the faith we shared, will make our trip to Uitspan an adventure that we will always hold dear to us and hope that someday we may be privileged enough to do it again. wonderful and descriptive story and an even better experience! Well done, Gene. Enjoyed your story! Congrats on a great hunt with a wonderful family! Join in and write your own page! It's easy to do. How? Simply click here to return to African Hunting Stories. Looking for specific information on our website? Type any word in the window below and click "Find" or view our site map. Pangolins have poor sight and do not have any external ears, although their hearing is very good. Their sense of scent is well developed and they locate ants nests by smell. 'Uitspan' is an Afrikaans word that means place of rest. When the Boer settlers moved inland in Southern Africa in the 1800's, they used ox carts. When they found a spot with game, water and green grass, they arranged their ox carts into a circular laager for protection against wild animals and stopped for a rest. They referred to such an action of relaxation for man and beast, as Uitspan. Greater Southern Kudus are famous for their ability to jump high fences. A 2 m (6.56 ft) fence is easily jumped while a 3 m (9.84 ft) high fence is jumped spontaneously. These strong jumpers are known to jump up to 3.5 m (11.48 ft) under stress. I created our website with the help of SBI. Some animals have one sense more than man! The flehmen response is a particular type of curling of the upper lip in ungulates, felids and many other mammals. This action facilitates the transfer of pheromones and other scents into the vomeronasal organ, also called the Jacobson's Organ. This behavior allows animals to detect scents (for example from urine) of other members of their species or clues to the presence of prey. Flehming allows the animals to determine several factors, including the presence or absence of estrus, the physiological state of the animal, and how long ago the animal passed by. This particular response is recognizable in males when smelling the urine of a females in heat. Click here to read how the Kudu antelope use this sense.